When my son was born, I joined a local new moms group which I HIGHLY recommend. It was a supportive, safe place that I found integral to my early months as a parent, and I also met some wonderful mamas. Time flew by and all of a sudden I wasn't such a new mom anymore. Moms would come to the group every week with newborns that looked so tiny compared to my son who was now many months old. One of these newer mamas called me one morning right after dropping her 3 month old daughter off at day care for the first time in tears. Sympathetic to the panic that accompanies that experience I tried to comfort her but not without bursting into tears myself. "I totally understand! I'm crying too now." Then we both started laughing. Other than getting her to smile and giving her sorrow a little break, I explained to her that this whole parenting thing is like getting organized...one tiny baby step at a time. Just focus on what's right in front of you and worry about getting that thing done before you move on to thinking about the next thing. Yes, you can plan ahead and have a big goal (e.g. get the whole house organized). In fact, I recommend that. However, it's important to be flexible and forgiving in how you reach your goal (e.g. a little organizing a few days a week versus getting it done all in one weekend). It's how I get through the day as a parent as well as how I teach my clients to move through their mountains of clutter (and procrastination) successfully, and that brings us to the 5 good parenting tips below. Enjoy! Here they are! Five good parenting tips that can apply to getting organized or vice versa. 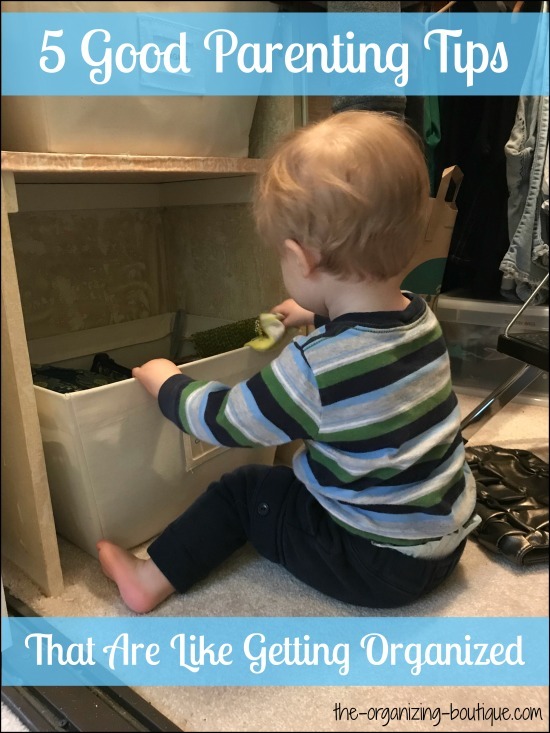 Hopefully you can use this advice for both being a parent and attacking your clutter. You know - two birds, one stone. 1. One baby step at a time. This good parenting tip can actually be taken literally, of course. :) What I'm referring to here though, is the overwhelm. You know that feeling that rushes over you when you're looking at a mountain of clutter that you need to go through? Gasp. Deep breath. Just run. Yeah, that one. It's like the wave of craziness that invades your head as a parent. Thoughts are uncontrollable, emotions fly high and YET we somehow survive as parents because we have to. We can't really run away like we can from getting organized, but the answer is the same. What's the next small thing you can do to move forward? That's it! It's that simple and so powerful at the same time. The next time you start talking yourself out of dealing with a pile of clutter, STOP. Take one little thing out of that pile, make a decision about what to do with it (e.g. throw it away, recycle it, give it away, put it away) and do it. Then, if possible, move on to the next thing and the next until that pile of clutter is gone (which can happen over several days, just be consistent about it). It's funny that the answer to a feeling so big is an action that is so very small, but it truly works. Just remember: baby steps. By the way, taking baby steps is exactly how I instruct my clients to get organized and it works wonders! If you're (tired of seeing stuff everywhere in your house and) interested in exploring the concept of overcoming your procrastination and clutter piles by doing little (very un-overwhelming) tasks then check out Do The Opposite Of Nothing. Wait, what?! What I mean with this good parenting tip is you can always try again tomorrow. No, I'm NOT suggesting you procrastinate or put anything off until later (and certainly don't do it repeatedly). What I AM saying is, if you tried something today (like attempting to get rid of a clutter pile) and it didn't work (that clutter pile remains), let yourself off the hook for the rest of the day and try again tomorrow. Sometimes leaving something alone for a while and coming back to it with a rested mind and a fresh perspective, is THE difference between success and failure. Let me give you an example. When our son wouldn't take a bottle, I nearly lost my mind with worry about what would happen when day care started. When I say he wouldn't take a bottle, I mean he would. not. take. a. bottle. What did we do? We kept trying, everyday, changing the variables (e.g. who fed him, where we fed him, how we held him, what time of day, etc.) any which way we could until he took the damn thing. Did he finally take it? Yes. Did we have to be persistent. Big YES. But, we had to repeatedly try a little today and then let ourselves off the hook until trying again tomorrow. Otherwise, we would have gone insane...which, I did finally break down about this but I'm going to blame the hormones and the indescribable exhaustion. The important takeaway is that we kept trying. We never gave up. SO...try today and if it doesn't work, just try again tomorrow. You can change a variable or try to come up with new ideas for attacking your issue, but you've got to actually try again tomorrow (repeatedly) for this concept to work. (And if you want to know how we actually finally got our little boy to take a bottle, you can read the whole story plus the creative solution here). 3. Be gentle and forgiving with yourself. As a person, it's pretty easy to let the gremlins in your head take over and be hard on yourself. As a parent, easy isn't even the right word for the deluge of guilt that can take over with no effort what. so. ever. I remember telling my husband that I was getting literally nothing done one day when my son was still a newborn. Looking back on this moment I can tell you the amount of pressure I put on myself was completely ridiculous. Not to mention that my statement was straight up false. BUT nothing would make me feel better until I felt like I had accomplished something, so the next day I kept a running list of all the things (literally every little thing was recorded) I got done while home with my newborn. Boy, did I surprise myself. Kissed baby and got smiles back! Played on floor with baby and got big smiles! As you can see, I certainly was getting stuff done. Now, not every day was like this one; this particular day was very successful. I mean, did you see that I cleaned the couch, took a shower and also got to nap?!! However, even on days when I wasn't this productive, there was still a lot getting done and I wasn't giving myself enough credit. On top of the new parent exhaustion and overwhelm, I was piling on unnecessary negativity. Who needs that?! After I kept track and created this list, (I felt silly and) I let myself off the hook and didn't set my expectations so high. I immediately felt the weight lift off of my shoulders, and with that came the emotional space and mental freedom to enjoy my little one even more. Be gentle, be forgiving, shed some light on what you DID accomplish and if that clutter pile doesn't completely disappear today, go back and reread good parenting tip #2 above. Along the same lines as being gentle and forgiving with yourself, comes this idea of letting go of perfection. First, there is no perfect. There's Pinterest AND there's Pinterest Fails for a reason. Pinterest is a wonderful tool for inspiration, but Pinterest Fails are much closer to real life (and a lot funnier). Keep that in mind the next time that negative self talk takes over. Second, even if you do reach your idea of perfect, how long will it last anyway? Life is always happening, so my guess is not very long. Therefore, why put yourself through so much trouble and mental anguish for something that will probably only be noticed by you? Think back to your childhood. Do you EVER remember thinking, or better yet even noticing, that the house wasn't sparkling clean all the time? Or disappointed that you didn't get an organic home cooked meal every night? I'm guessing the answer is no. Whatever it is you're working on, get it done rather than perfect. (For example, do your files really need to be perfectly labeled with a label maker label? Or can you simply write the name of the file on it and move on?) Then use the time and energy you would have expelled on perfection worries, and go enjoy your little monsters before they grow up too quickly. In fact, go make a fun mess with them; that, they will remember. Quick side note: I'm not just preaching here. I also strive for perfection on things when I shouldn't be wasting my energy. Since my son was born, I have learned to let go little by little and really do enjoy playing (aka making a huge mess) with him with his toys. BUT THEN, I show him how easy and quick it can be to clean up. I'm pretty sure he's learning it, but I'll have to get back to you on this whole idea of raising organized kids. Future blog post coming right up! When your child does something that shows positive progress, you celebrate with a clap or a smile or a social media photo share or a reward of some kind, don't you? Why not do that for yourself?! We all know why celebrating victories is important, which is why we remember to do it for our kids but somehow easily overlook it for ourselves. No more! The next time you make any kind of forward progress that you're proud of, celebrate it. How you positively encourage yourself is up to you - a glass of wine, a piece of chocolate (or five), a well-deserved massage, sharing a photo on social media, mom's night out with the girls, doing the happy dance - but no matter what you decide, you've got to actually do it. This also works better if you have some sort of accountability partner. Perhaps you could work out a deal with your husband who will watch the kids so you can go out with your friends every time you complete the desired decluttering goal. Or you could strike an accord with another parent who is going to organize their home as well and you celebrate wins together. It doesn't have to be expensive, fancy or time-consuming, just remember to take some time to celebrate yourself and all that you do. There you have it - 5 good parenting tips that are like getting organized. I hope you found them interesting and helpful on both fronts.